In last night’s new episode of Marvel’s Agents of S.H.I.E.L.D., Coulson must defend his former flame from a super-powered stalker. As we have known for a while, he used to date a cellist. At last we get to meet her and hear her play! 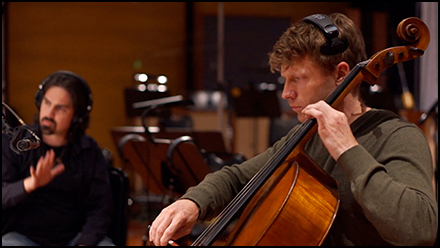 In my new video blog, go behind-the-scenes to the recording session where we recorded the virtuosic cello solo for this uniquely musically-themed episode. 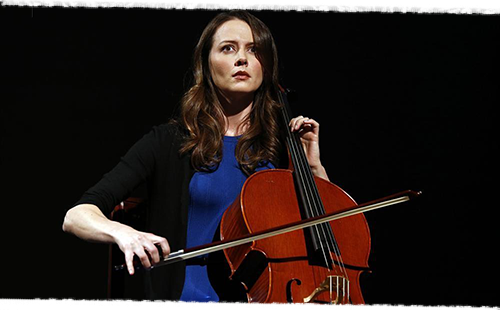 When I first watched Marvel’s The Avengers I was struck by a passing line of dialog that revealed Agent Coulson was dating a cellist. Immediately, I wondered who she was and what sort of music she played. Two years later, to my surprise, I had the opportunity to write her original music and watch her character perform my composition on screen! 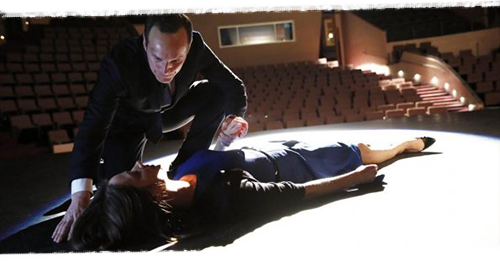 In the episode, Coulson and his team must protect The Cellist (now revealed to have a name, Audrey) from the electrically super-charged villain Marcus Daniels, aka Blackout. 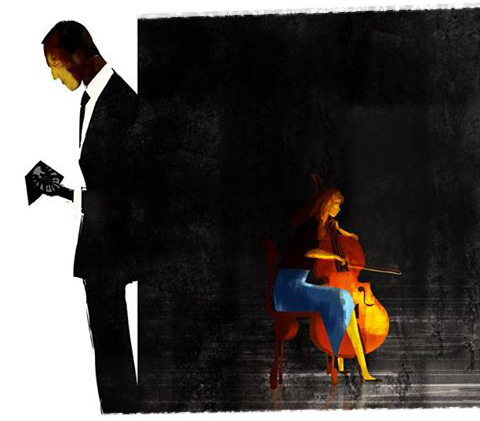 To lure him out of the shadows, Audrey performs a beautiful cello solo. Immediately, my mind overflowed with ideas. I wanted to expand the slow arpeggiations of the theme into fast scales, modulate into different keys and write a piece that could only be played by a truly professional cellist. The only problem was that Amy is not a cellist! This presented a challenge: how do we take an actor and have them appear to be a virtuosic professional musician? To pull off this illusion, I collaborated closely with the producers, the director, the actress and a cellist. All our combined talents were needed to make this scene work. Executive producer Jed Whedon and director Vincent Misiano both provided valuable insight. Jed’s musical instincts proved essential once again, when he proposed I compose a handful of simple exercises for Amy to learn and mimic. I wrote a collection of three short, repetitive musical figures set to various tempos, and sent them to Amy, who was working with a cello coach. My hope was that Amy could memorize the muscle motions in her hands and then be able to focus on her true task, creating the character’s emotions on camera. I didn’t want her to get bogged down in tedious musical minutia. Tedious musical minutia is my job! Vincent carefully directed the scene to get some shots where her hands are clearly visible and others where her movements are obscured. Moving into post-production, he worked with the producers and editors to stitch the shots together in a way that made narrative sense. I assured him not to worry about whether the hands lined up to a beat, so he could just focus on telling the story. Once the scene was working structurally, they handed it to me. That’s when my real work began. I faced a four minute scene that intercut a soulful cello performance with a scary sequence where Skye is walking towards a horrific discovery. In almost every shot of Audrey, we can see her fingers, her vibrato and her bow. My task was to compose a cello solo that would line up with her every muscle movement, sound beautiful on the shots of her playing, and quickly pivot to tension to serve as underscore during the Skye scenes. Getting the timing of the notes was a big challenge. I spent hours in a MIDI sequencer, going through the scene frame by frame, putting markers on every instance where her fingers moved, her bows changed, when she had vibrato and when she didn’t. Then, I had to ensure that the notes were in the corresponding range as her fingers. For example, if her finger was on the highest string, the A string, I knew I had to write a pitch higher than A. I could surmise if she was a few inches from the top that the pitch was probably a B or perhaps up to a D. I didn’t need to be 100% accurate, because we often couldn’t see precisely where he fingers where in the close-ups. I could easily settle for 97% accuracy! Using all the visual references in the edit, I made careful observations of the times when notes occur, the durations of each note and the approximate register of each note. That was fine, but wouldn’t matter if the music didn’t communicate the necessary emotion. The true challenge for me was to take all those constraints and compose a piece of music that satisfied them all and yet felt soaring and lyrical. After all that, I had to write orchestral score around the cello performance to help sell the tension, emotion, horror and triumph. Yeah, this took me a while. I know what you’re thinking. This sounds like the ravings of a madman. The easier approach would have been to write the composition first and have Amy mimc the whole thing, or bring in a cello double to master it for close-up shots. If the scene had only been about the cello performance, that may have been our method. Because the scene intercut multiple times with a different scary scene, it would have been impossible to lock down those musical mood shifts in advance. The composition would ultimately be chopped up into bits by the time the scene was fully edited. Besides, having to memorize physical gestures for a lengthy difficult composition would have put undue pressure on Amy, who already had her hands full focusing on character work. Amy, the producers and I also agreed that it should be her hands in the close-ups. While this approach created more work for me in post-production, it yielded a more convincing on-camera performance. Writing the cello composition was just the first step. The second required finding someone to actually play it and catch all the little details that only a true cellist would. 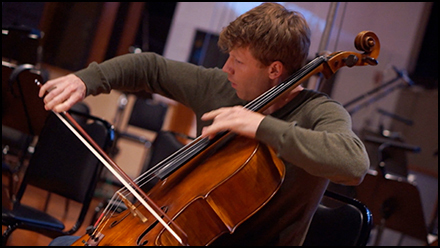 I brought in Eric Byers, the cellist from the Calder Quartet (a group that has collaborated with me on Da Vinci’s Demons, Black Sails and several other exciting projects). I’ve known Eric for a long time. We were freshmen together at the USC Thornton School of Music and, in fact, he played a virtuosic piece for solo cello and effects processor I composed for my senior student recital! I knew he was up for the challenge. As you can see from the video blog, we spent a lot of time in the studio matching the performance of Amy’s fingers and hands. Every little shift had to be perfect, every movement of her fingers had to correspond with a new note from Eric. Most challenging of all was the vibrato. In some shots, Amy mimed vibrato and in others she didn’t, so we had to be very mindful about when Eric used vibrato. Even though I notated the cello performance to the finest detail, we still found that Eric needed to watch the video with the same laser-like focus as when he reads music. In this unique scenario, the video was as important as the notes. The slightest shift could result in a disconnect between audio and video that would distract the audience. Part of my job became that of a director, and part of Eric’s became that of an actor. I needed to give him character motivations! For example, there is a moment when Audrey looks up and sees Daniels approaching and she suddenly stops playing out of fear. Eric and I recorded a dozen different versions of the “sudden stop.” A few of them were hilarious, where Eric would suddenly jump to a hideously wrong note that sounded like a joke out of a cartoon. Others were too subtle, and did nothing to help sell Audrey’s fear. I hope we finally found the perfect approach: Eric turned his bow at a slight angle right as Amy lifts her eyes, creating a brief, breathy texture in the sound. The note stops abruptly, but still sounds professional, all while communicating the sense that something is wrong. Scoring “The Only Light in the Darkness” has been my most rewarding challenge yet in a series that has been an absolute joy to work on. Collaborating with Jed Whedon, Vincent Misiano, Amy Acker and Eric Byers to create this on-camera performance was a creative thrill, and allowed me to explore a side of the Marvel Universe that first peaked my curiosity two years ago. I am very excited to see what other corners of this Universe I get to explore next.